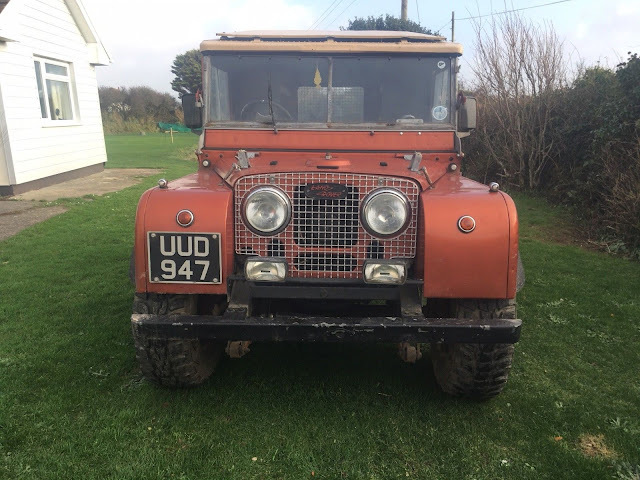 Here we have my 1950 series one 80 inch, rare ex military model released from the army 26th July 1963 and only 6 owners including me since! Firstly I would like to say that I am not responsible for any of the modifications or the awful colour that this poor little humiliated 80 has had to endure! As such that means what you see is what you get and I do not have any of the original parts. Please read on it`s not all bad. Original leaf sprung 1950 chassis with the early type narrow front springs. It has a custom fuel tank so one of the original tank outriggers has been cut off (easy to source and replace) and as well as the fuel tank under the driver`s seat it is filled from another tank (linked together) situated behind the front seats in the spare wheel well. The original rear crossmember has been modified in that they kept the original square ends but have put in a centre piece that is not as deep as the original with a smaller PTO hole which the exhaust now exits through. Very rattly exhaust! 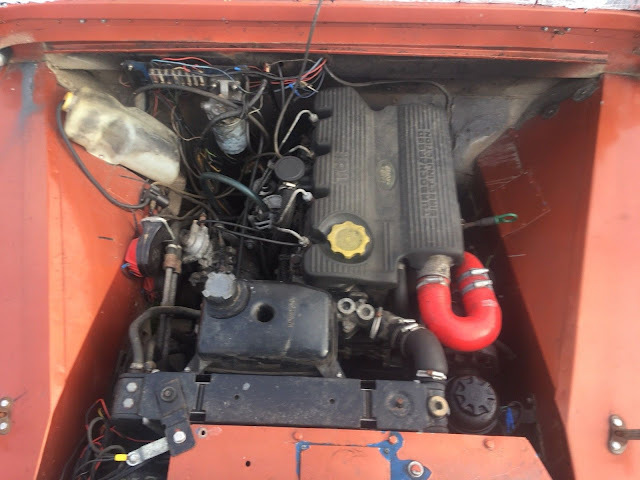 Other wise chassis in good solid original condition, would not take much to make all original again with the right rear crossmember and new fuel tank outrigger or leave as is. See photo for worst part of chassis, driver`s side next to front spring rear hanger would want a small patch doing in next 12 months but easy to get too. She`s no patchwork quilt seen alot worse chassis. 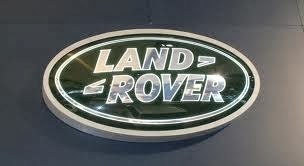 There is a 200tdi discovery engine fitted without the intercooler. Still has original series 1 pedals though which is nice although looks like the accelerator pedal is modified. 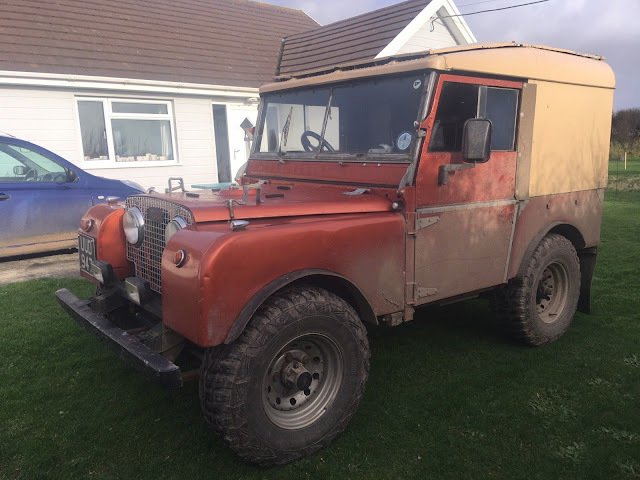 Rare hard top which is remarkably straight, although someone has put a safari double skin on it which of course they did not do until later series 1 models came out. It really does drive very nicely indeed especially with the power steering and the tdi means it will do 70 mph and keep up with modern traffic while returning 40 plus mpg as it`s so light. I wanted an 80 to use as a daily driver and this is it. Think the front brakes want a wheel cylinder as have recently had the rears done with new shoes and cylinders but it still needs a second pump of the pedal to pull up to a decent stop. I would prefer any genuine buyer to view before auction ends as with any vehicle you have not modified yourself you overlook or get used to how it without realising it is changed from original. No rear cat flap, it is a series one rear door cut in half! Does the job though. So in all either keep as is (perhaps not the colour!) and use as an economical tax and MOT exempt daily driver (workhorse) as I have been or perhaps do the bits to get the chassis back to original spec paint her green and get a soft top. In my opinion worth doing either way and being an ex military model it is slightly rarer with the one piece opening bulkhead vent and the trailer electrics connector. Original number plate still with it and currently not fitted I do have it`s original military ID plate. No military grab handles present on the rear tub but these are still available from Craddocks as are original side lights. To be honest I had toyed with the idea of buying a scrap minerva as these are around 2-3k to buy now, then simply re fit the parts engine, gearbox, axles all back to series 1 spec but I just do not have the time plus I already have a mint original 1953 80 as well. 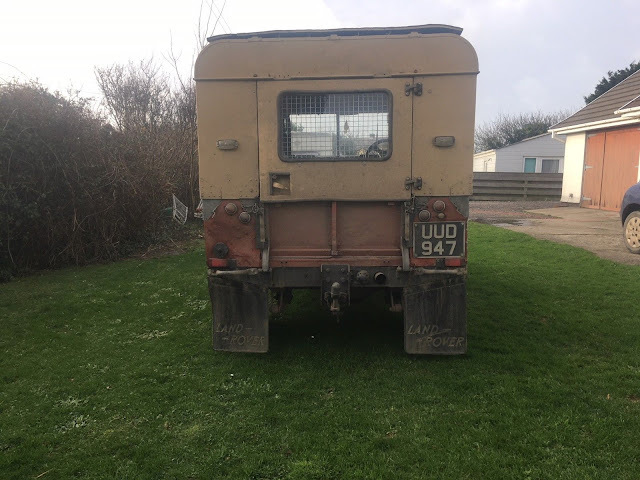 I will include a new galvanised front bumper as the one fitted has been painted black and I also have an original spare wheel holder for the rear tub that can go back if you wish to move the extra fuel tank. Sorry no overseas bidders, 100 non refundable paypal deposit within 24 hours of winning auction, collection within 1 week and payment via instant bank transfer or cash please.